In a small book covered with parchment, such as were the record books of the Parish and Town at that time, on the first page we find written in a clear, bold hand, as by a goose quill pen in the hand of a master, the words, to wit: "This Book belongs to the Stoughton Musical Society and contains the Rules and Regulations whereby the said Society are governed. In the same clear, legible hand-writing follow on the next page, marked page 1st, the regulations of which we give a copy. 1st That there shall be a President, Vice President and two Treasurers or more, as the Society shall order. 2nd The President only shall beat the Time openly; and if the President be absent, the Vice President shall preside; and if they both be absent, the Society shall choose a President pro-tempore. 3rd Every member shall behave with Decency, Politeness and Dignity; and whoever behaves disorderly shall be punished according to the nature of his offense, according as the Society shall order. 4th There shall be a Register chosen, who shall Record all the Laws and Regulations of the Society, and also shall take account of all the Fines and other Monies belonging to the Society and shall transmit an account of the same to the Treasurer or Treasurers. 5th The Treasurer shall keep a fair account of all the Monies belonging to the Society and shall expend the same from time to time as the Society shall order. 6th There shall be a Committee chosen who shall examine all Persons who shall wish to join the Society, and no one shall be admitted without their approbation. 7th In order to raise a fund to defray necessary expenses, every Member shall pay, or cause to be paid, to the Treasurer, two shillings, and no member shall be admitted unless he shall sign the Articles of Regulations, and also pay, or cause to be paid, the same sum of two shillings to the Treasurer. 8th The Times and Places of meeting shall be as the Society shall order from time to time; and the Society shall be dismissed at nine o'clock in the evening. 9th The Society may from time to time make further Regulations as, to them, shall be judged necessary or convenient. Now they are organized and they may be supposed to sing one of the tunes of their favorite author Billings. 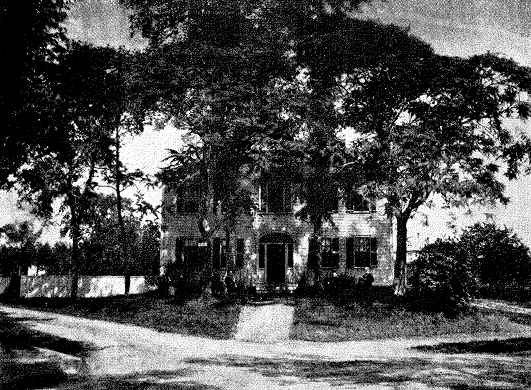 This meeting and subsequent ones were held at the house of Robert Capen, which stood at the corner of what is now Park and Seaver Streets in Stoughton. This house was built around 1749 and some of the timbers used in the construction of the main building are still in existence, a piece of which we have in our historical collection. The timber from which this piece was cut was of pine, hewn by hand, and the tree was possibly growing when the Pilgrims landed. In this house, William Billings taught his famous singing school in 1774. Elijah Dunbar, Esq., President. Capt. Samuel Talbot, Vice President. Mr. Joseph Smith, 4th, 1st Treasurer. Mr. Andrew Capen, 2nd Treasurer. and it was voted that the book called the Worcester Collection be purchased by the Society for further practice." The next meeting of the Society was held at Robert Capen's, Stoughton, the fifth day of June, 1787, and it was there voted to choose a committee to correct and amend the articles of the Society, and also to choose a committee of three to examine the Treasurer's account. The committee chosen were Lieut. Samuel Capen, Capt. Samuel Talbot and, Maj. Peter Crane. It was also voted that the Register be directed to purchase a book to keep the Records of the Society. It was then voted to adjourn to the first Monday in September next. Met Monday, Sept. 3, 1787, at Robert Capen's and adjourned to the 8th day of October at Robert Capen's to hear the report of the committee chosen in June to correct and amend the rules, and for the purpose of choosing officers for the year ensuing. Capt. Samuel Talbot, Vice President. Lieut. Samuel Capen, 2nd, Secretary. Mr. Joseph Smith, 4th, 1st Treasurer. Mr. Andrew Capen, 2nd Treasurer. As a design of the institution and the end of all Societies ought to be the good of the community at large, and the members in particular, they should therefore be established on solid and lasting foundations and be governed by good, wholesome and prudent laws, and as singing or vocal music is a divine institution and the noble talent of performing it most certainly was given for improvement by Him, who made us of that elevated rank of beings that we are capable of sounding forth His praise. And as the powers of harmonious music are most admirably calculated to humanize the ferocious passions, to increase the various emotions of the mind, the different degrees of sensibility and all the feelings of the heart, that not only the sense of hearing receives the highest gratification from sounds the most congenial to the organs of man, but we are made partakers at one and the same time of instruction and delight in viewing the noblest work of the Almighty, put in motion to answer the noblest ends, the exciting and cementing brotherly love. We, therefore, esteem it our duty to study to promote that harmony which is pleasing to our Maker and so delightful to ourselves. Stimulated with these salutory and laudable motives, we, whose names are underwritten, form ourselves in a society by the name of Stoughton Musical Society, for the above implied purpose of practicing vocal music, do voluntarily and of our own free will and accord, jointly and severally, covenant and engage and bind ourselves to be governed by the following rules and regulations. Rule 1st That there shall be a President, whose business shall be to Regulate the meetings, Direct the Music, Beat ye time and see that everything be conducted with Propriety, Politeness, Honor, Dignity. Rule 2nd That there be a Vice President, who shall, in the President's absence, supply the vacancy. Rule 3rd That there shall be one Secretary, who shall Record all Rules and Regulations of the Society, take account of all fines and other Monies, and keep an exact Register in which each member's name shall be inserted, with columns prefixed in which shall be carefully Minuted their attendance and non-attendance, in order that each member's conduct, respecting attendance, may be fairly and clearly ascertained. Rule 4th That there shall be two Treasurers, who shall collect all the monies that shall be due to the Society, and shall expend the same from time to time as the Society shall order, and transmit a fair account of both money and expense when Requested. Rule 5th That there shall annually be one meeting in the Month of October, at which all officers (Places of Vacancy excepted) shall be chosen by ballot. Rule 6th That there shall be a committee of examination and approbation, who shall examine all candidates, who shall wish and offer to join the Society, and no one shall be admitted without their approbation. Rule 7th That no person shall be admitted as a member without first subscribing to the Rules and Regulations of this Society and paying the sum of two shillings. Rule 8th That the Treasurer shall be supplied with money from time to time to defray Necessary Charges, and each Member shall pay his proportionate part thereof. Rule 9th That if any Member of said Society shall absent himself two meetings successively, he, at the next meeting he attends, be accountable to the Society for a reasonable and satisfactory excuse for his non-attendance, and every Member so offending shall freely and voluntarily give such satisfaction, either by apology or a fine, or by any other means to the acceptance of the Society; otherwise shall be considered destitute of that politeness which is the true mark and characteristic of the Gentleman. As also an open violation of the Rules and Regulations of this Society and shall be treated accordingly. Rule 10th The Society may from time to time make further regulations as shall be judged Necessary or Convenient. The foregoing Rules and Regulations agreed to and subscribed this eighth day of October, An. Dom. 1787. Friend Crane John Kenney, Jr.
Voted to adjourn to Oct. 21st, 1787, at Capt. Joseph Smith's. We find from the History of Canton that Joseph Smith was the son of Asahel Smith and kept the tavern on the west side of the road to Dorchester Swamp, now Pleasant Street. The building stood on the northwest corner of what is now Pleasant and Independence Streets. A new building was erected in 1808. This land, containing 270 acres, was leased from the Indians by John Wentworth and William Sherman; recorded Aug. 17, 1732. 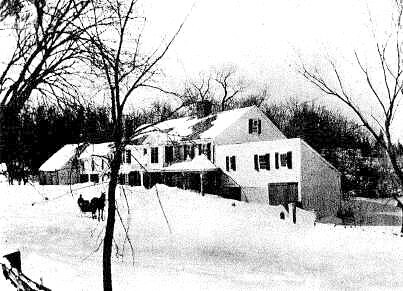 This place was sold to Andrew Capen, of Stoughton, in 1793, then sold to the Town of Canton and used for a Town Farm. Elijah Dunbar, Esq., President.-Joseph Smith, 1st Treasurer. Capt. Samuel Talbot, Vice-Pres.-Andrew Capen, 2nd Treasurer. Committee of Examination: Major Joseph Richards, Jonathan Capen, Samuel Capen. There is no mention made in the record of singing. We presume that they sang and that the book they used was the Worcester Collection. They voted Oct. 6, 1788, to meet at Capt. Joseph Smith's, Oct. 21, 1788. During this time Mr. Robert Capen died, Oct. 20., 1788. No record is kept of the doings of this meeting except the tally of attendance. Nov. 10, 1788, they met at Andrew Capen's, when 14 members were present. Elijah Dunbar, the President, and ten others being absent. On the 8th of Dec, following, they met at Joseph Smith's; the President, Elijah Dunbar, and 13 others being present. Jan. 12, 1789, they met at Capt. Joseph Smith's; the President, Elijah Dunbar, and 13 others being present. The next meeting was Feb. 26, 1789, at Samuel Tolman's; the President, Elijah Dunbar, and eleven others being present. Samuel Tolman was the son of Johnson Tolman, who belonged to one of the old Dorchester families and settled in Stoughton, and built a house in 1749, near the site of the present Tolman School. March 16, 1789, they met at Andrew Capen's; the President, Elijah Dunbar, and 14 others being present. They met again March 30, 1789, at Capt. Joseph Smith's, and there were present, the President, Elijah Dunbar, and six members. The next meeting was held at Andrew Capen's, June 1, 1789, the President, Elijah Dunbar, and eleven others being present. No meeting was held till Sept. 14, 1789, when the President and ten members were present. Dec. 9, 1789, was the next meeting at Elijah Crane's; the President, Elijah Dunbar, and ten members being present. Elijah Crane lived at Ponkapoag, first in a house still standing, nearly opposite Green Lodge Street; later he took possession of the old tavern, originally kept by Deacon Joseph Tucker, in 1742. It was situated very near the site where stands the Crane Schoolhouse, Canton. Elijah was landlord from 1789 to 1800. This tavern, after Deacon Tucker's widow ran it, was kept by Samuel Capen, Secretary of this organization. Samuel was a famous singer, and composer as well. He was author of "Norfolk Harmony." The 28th of the same month, they met at Andrew Capen's; the President, Elijah Dunbar, and nine members being present. Jan. 4, 1790, they met at William Bent's tavern; the President and ten members being present. Between the old Blackman house and Carroll's tavern on the southerly side of Washington Street, Canton, stood an old-fashioned house, with a lean-to roof. From 1785 to 1800, it was known as the "Eagle Inn". William Bent kept this tavern until his death, Oct. 16, 1806. About 1824, it was sold to Gideon Mackintosh. It was later known as the Dunphe house. Samuel Capen, Andrew Capen, Treasurers. Committee on Examinations: Maj. Joseph Richards, Lieut. Jonathan Capen, Samuel Capen. This is the first meeting where we find any record of the expense, which was 4/6. At this meeting, this important vote was passed: "Voted that each member of the Society be holden to pay his proportionate part of the expense of said Society till he be regularly dismissed from the same." The new Secretary, chosen on this occasion, afterwards became distinguished and famous in military circles as Major-General of the First Division of Massachusetts Infantry, and in civil circles as a sheriff of Norfolk County, and an active and influential man in all town and parochial matters. The next meeting was held at William Bent's, Feb. 15, 1790, where the expense was 4/ (four shillings). Feb. 23rd, they met at Col. Gridley's, Canton; the President and eleven members being present, and the expense is given as "gratis". 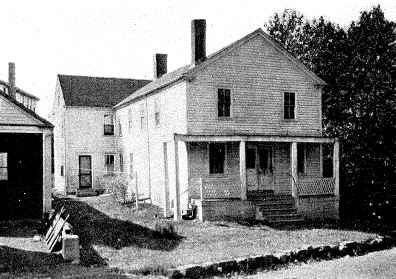 Col. Gridley's "Stoughton Villa," so called, was situated on the western side of the county, or Taunton road, about 200 feet from the northerly boundary of lot No. 40 in the twelve divisions of Dorchester, and slightly in the rear of the house now numbered 180 Washington Street, Canton. The house was probably built by Nathaniel Leonard, and a son of Uriah Leonard. Uriah came to Canton about 1709 and was the expert man at the old iron works, near where the railroad bridge crosses Neponset St.
Nathaniel and his brother Walley bought quite a lot of land and the second iron works, called "London New," about 1740, and built the house where he lived till his death. Colonel Gridley bought the home lot and other land in 1770-2, and moved to the new house, living there till he died. Mr. Thomas Dunbar bought considerable of the Gridley land, and the house from Uriah and Polly Gridley Leonard in 1804-5. In 1813, he tore the house down and built another, almost in front of the old house, where he lived till his death in 1856. That house is still standing and is No. 180 Washington St. (and in the yard, the peonies still blossom from the original stock which Col. Gridley planted. - Canton History, 1893). At a meeting of the Society at Andrew Capen's, on the 9th of April, 1790, the expense of the Society was up to this time 13/10 and proportioned on the members at 9 1-4 pence to the Poll, which sum is in full of all expense against said Society, except 8/8, which is due from Col. Nathan Crane. At this same meeting it was voted to dismiss Mr. Atherton Wales. Voted that Mr. Smith be not made up in the bills, since he has been out of town. Voted that Capt. E. Wales be omitted in the Tax. Voted to adjourn this meeting to next Artillery Election day, to meet at Capt. William Bent's at 2 P. M.
In the year 1790, or thereabouts—so the tradition runneth—the art of singing was so well developed in Stoughton that the singing in church attracted the attention of the ministers, who indulged in the neighborly acts of exchanges. With the best intentions to increase the efficiency of their own church service, these ministers reported that they heard better music at Stoughton than at any other place. Reports then took to themselves wings, as they do now, and they soon reached the good people of Dorchester, even the singers of the old First Parish, from whose broad limits have sprung so many other churches to bless the land. These well-trained singers of the old town, so near the "Bay," from whose shores emanated then, as now, from the "Hub," excellence in art, grace in scholarship, and refinement in living, could ill brook the judgment that Dorchester did not wear the honors in the art of singing as in many other accomplishments. Confident in their ability and ready to test it, they challenged the Stoughton singers to a trial. The challenge was accepted; a meeting arranged. It was held in a large hall in Dorchester, and says the narrator, who was one of the singers, "The hall was filled with prominent singers, far and near, including many notables from Boston." The Dorchester contestants had a "bass viol" and female singers. The Stoughton party consisted of 20 selected male voices, without instruments, and led by "Squire" Elijah Dunbar, the President of the Stoughton Musical Society, who was not only one of the most accomplished singers in his day, but distinguished for his commanding presence and dignified bearing. The Dorchester party sang first an anthem, recently published, executing it with grace and precision. The Stoughton party followed with Jacob Frenches new anthem, "The Heavenly Vision," rendered without book or notes. The applause was unbounded as they took their seats. Again the Dorchester choir sang; then, to close the tournament, the Stoughton Choir sang, without book, Handel's grand "Hallelujah Chorus," recently published in the country by Isaac Thomas. The Dorchester singers acknowledged defeat and endorsed the taste and judgment of the ministry. So endeth this incident of the olden time. A meeting was adjourned to June 14, 1790, at Andrew Capen's. At this meeting, Mr. Capen presented a supplemental account showing a further expense of 12/2, each one's proportion being 8 / . Voted to adjourn to Capt. Jos. Smith's, Oct. 4, 1790. 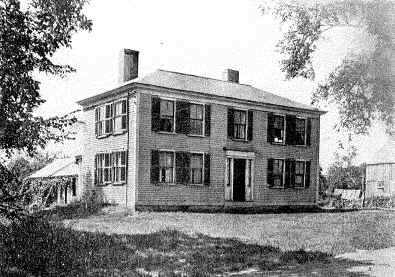 The meetings thus far had been held in Stoughton, but at a meeting held at Samuel Wales, Dec. 20, 1790, it was voted to adjourn to Jan. 17, 1791, to meet at Col. Seth Turner's, in Braintree. Samuel Wales lived on the east side of Pearl Street, below Belcher's Corner, Stoughton. The original house was a large, old-fashioned building, later known as the William Belcher place, and still later as Walter Swan's. The first building was torn down rn and the present house made from it, now 425 Pearl Street. Before Central Street was built, there was an old road from Curtis' Corner (now Avon) by the Hotel Neighborhood, and John Atherton's by or through his place to the present Pearl Street. The meeting at Col. Seth Turner's is the first record of any meeting being appointed out of the Town of Stoughton. The building in which they met is still standing, but moved from the original site on North Main Street to No. 128 North Street, Randolph, formerly a part of Braintree. Col. Seth kept a grocery store on the site of the Public Library in Randolph. The next meeting was held at Capt. 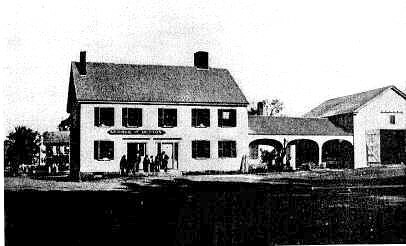 John Tucker's, in Stoughton, Feb. 12, 1791, by invitation. Capt. 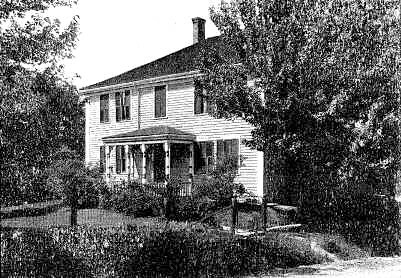 Tucker lived on what was later the farm of William Shaller on Green Lodge Street, now owned by the Hoosic Whisick Club. Capt. Tucker's was just east of the William Shaller house; an old lane ran through the farm. The meeting adjourned to meet at Samuel Wales, Stoughton, Feb. 22, 1791, which had not then become a national holiday, as George Washington was then alive. The second mention made of the dismissal of any member was Col. Crane, who, it was voted, shall be honorably dismissed by paying, agreeable to his request and consent, 8/8. This was Col. Nathan Crane. During this period of nine years, many important events of a public nature had occurred. In 1797, the town was divided and by parochial bounds, the first Parish taking the name of Canton and was made a new town, and the second Parish, over which Rev. Jedediah Adams was ordained in 1746, retained the name of Stoughton. President Washington had died and several civil and political changes had taken place throughout the country, particularly in New England. In 1793, Norfolk County was created and Dedham made the Shire Town. Andrew Capen Committee on Approbation. Voted that the meetings in future shall be called by the President, Vice President and Secretary. At a meeting of the Stoughton Musical Society at Benj. and Abraham Capen's Hall, Stoughton, on Monday, the 16th of Nov., 1801, the President and ten members present, and admitted as new members, Friend Crane, Thomas Dunbar, Samuel Leonard. Friend Crane was at that time a trader, who lived at a house occupied by Billings Hewitt, at Canton Corner. Thomas Dunbar was the son of Elijah Dunbar. Samuel Leonard lived at South Canton Village. At this meeting, a committee was chosen to revise the Constitution. Made choice of Elijah Dunbar and Samuel Talbot. Voted to adjourn to Monday, 21st of December, at Upham's Hall, in Canton, at sunset. Expense 2/10. Samuel Capen, Secretary. Upham's Hall was owned by Capt. 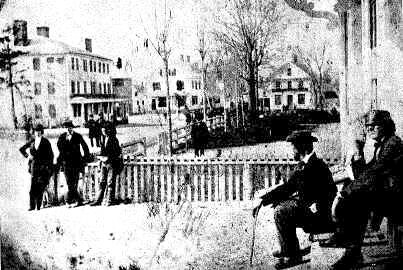 Amos Upham, who lived on the west side of Washington Street, opposite the road to Dorchester Swamp (now Pleasant Street) where the Huntoon homestead stands. 1st That there shall be a President to regulate each meeting of the Society. 2nd That there shall be a Vice President who shall, in the absence of the President, supply his place. 3rd That there shall be a Secretary,, who shall record all the rules and regulations and orders of the Society and record the names of all the members present at each meeting. 4th That the President, Vice President, Secretary and other officers for the time being shall continue to officiate in their said of-fices till others are chosen in their stead, and have accepted the same, and that the Society may at any general meeting, notice thereof being given at a meeting next preceding, choose such persons to execute said offices as they shall think proper, not oftener than annually. 5th As some expenses will necessarily arise at the meetings of the Society, some person shall be appointed by the Society to call for such necessaries as shall be wanted and the expense shall be equally borne by each member present. 6th As the Society wishes to promote and encourage the art of Singing, Friendship and Sociability, any member of the Society may at any meeting nominate such person or persons to be admitted into the Society as he shall think proper, which nomination or nominations being duly considered and voted by the Society, he or they shall be-come members of said Society and the Secretary shall transmit to him or them a copy of said vote. 7th As Death is the common and certain lot of all men, and as it would be decent and proper to pay our last respects to any of our deceased members, the members of the Society will attend the funeral, if notified and desired by the relations of the deceased. 8th As the peculiar sensation and pleasure excited by pieces of music well performed is highly delightful to those who may be spectators and hearers, no piece of music shall be performed when spectators are admitted, but such as shall be directed by such person or persons the Society may appoint for said purpose. 9th That all rules and regulations heretofore agreed upon by the Society are hereby repealed. Dated at Canton, Dec. 21, 1801. Voted to adjourn to William Capen's Hall, at Stoughton, the eighteenth of January, 1802. Samuel Capen, Secretary. William Capen lived on the east side of Central Street, near Elisha Swan's Tavern. This building was built around 1801 and later owned by Samuel Capen, "Big Sam" as he was called to distinguish from two other Samuels. The building is standing now, No. 133 Central Street. At the meeting, Jan. 18, 1802, there were 25 persons present, including the President, and it was "voted that any person being nominated as a member of the Society shall stand as a candidate till the next meeting." Mr. Jason French, of Canton, and Mr. Nathaniel Morse, of Sharon, were nominated as candidates. It was voted to adjourn to the 15th day of Feb'y at sunset, at William's Hall, in Sharon. Expense $3.00, equals 12 l-2c each. Samuel Capen, Secretary. William's tavern was just over the Sharon line, opposite land owned in 1803 by Jonathan Cobb. It was in existence and frequently mentioned about 1788. It was, presumably, the home of Jeremy Hixon later. The first meeting of the Society held in Sharon was on Feb. 15, 1802, at which Leonard Billings was admitted as a candidate. On June 7, 1802, there was a meeting at John Savels', Sharon. Mr. Savels' house was located on Sawmill Hill. Destroyed by fire. Savels' hall was over Pettee's old store in P.O. Square. The old store is now a dwelling on Station Street. 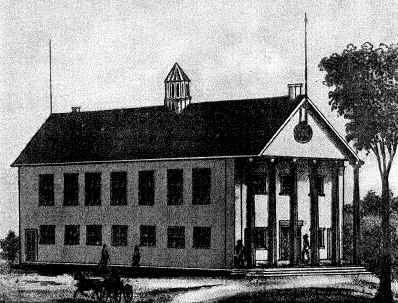 Dec. 6, 1802, there was a meeting at Blanchard's Hall, Stoughton, now Avon. The supper was 25c each. Horses, six pence. Spirits, "gratis." There was a vote of thanks passed "to the gentlemen, and ladies in particular, for their polite behavior." The first mention made of instrumental music was at a meeting at Capt. Amos Upham's hall, in Canton, Oct. 31st, 1803, in which Samuel Canterbury, Uriah Leonard, 2nd, Mr. Bomont and Lemuel French are mentioned as furnishing instrumental music. At this meeting, eight members from Dedham joined. Mr. Bomont was James Beaumont, who had just come to this country at the age of 23 years and built a dam near the viaduct, and in company with Wheatley and Fisher established the first cotton-mill, moved by machinery, in the State of Massachusetts. The instrument he played was a flute, which he afterwards used and which was in his possession at the time of his death in 1868, at the age of 90 years. The records now appear to be kept with proper regularity. Dec. 26, 1803, they chose two marshals, "whose business it shall be at all stated meetings to see that everything respecting the Society is conducted with decency and good order." The next meeting, held Dec. 26, 1803, at Col. Gill's, Canton. Col. Benj. Gill lived on the west side of Pleasant Street, between Sherman Street and Pequit Brook. The property is owned and occupied by Mr. Henry Bird, being opposite and somewhat south of the entrance to the Wampatuck Club. 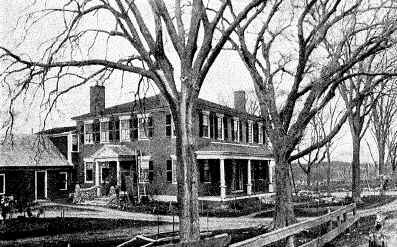 The old homestead was torn down about 1844 to make room for its successor, which has been remodeled. They here began to consider the compilation of a book for the Society's use, and on the 26th day of January, 1804, at John Savels' Hall, Sharon, "Voted to choose a committee to meet some gentlemen of Dedham to confer upon compiling a music book, and that Elijah Dunbar, Esq., Capt. Samuel Talbot and Samuel Capen be the committee." At a meeting held Oct. 15, 1804, at the "Capen House," Stoughton, it was "Voted that those gentlemen who played on instruments should be cleared from expense." Twenty-two members present and the expense was $7.72. Nineteen meetings were held between Oct. 15, 1804, and Jan. 2, 1809. Some of these meetings held at the Tavern of Thomas and Barney Richards, which is situated on the Bay Road, near the road that leads to Sharon. An old-fashioned square brick house still stands. 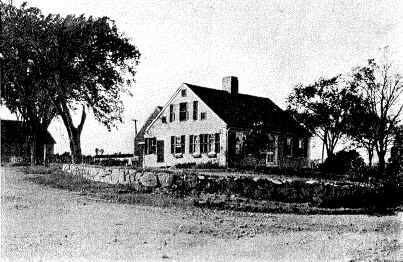 Other meetings held at Jonathan Cobb's, East Sharon, known as "Cobb's Tavern," still standing on Bay Road, opposite the street leading from Canton to Stoughton, by French & Ward's. To be neighborly seemed to be one of the characteristics of these singers, and distance was no obstacle in the way of enjoyment of these gatherings. We find that on Jan. 14th, 1805, they met at Thomas Willis'es Hall, Easton. This house was located on the easterly side of the Bay Road, just a few hundred feet south of the junction of Lincoln Street and Bay Road, or practically at the corner of Bay Road and Randall Road. A record of a meeting at Cobb's Hall, Feb. 13, 1807, closes with these words: After partaking an Elegant Supper with good Harmony, a motion was called for by the president for adjournment. Voted unanimously to meet at the same place at the Artillery Election, June next, at 10 o'clock A. M.
Cobb's Bill - Supper, 2/3 each; 1/3 for Drink. 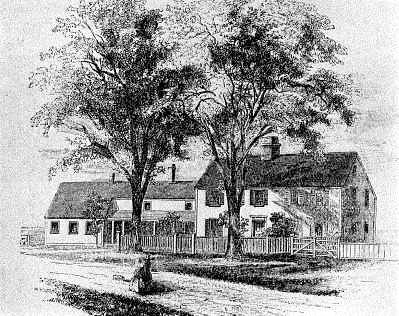 Carroll's Hall, Canton, is mentioned as a meeting place, being an old tavern—second house south, standing just west of Aunt Katy's Brook; erected in April, 1798, between Adam and Samuel Blackman's, later owned by Edward Cotter. Another place frequented was John Atherton's, Stoughton. Mr. Atherton lived at what is now 470 Central Street. A part of the original house is in the present structure, additions having been made in 1829. The original house was built in 1769. Jonathan Spear's home was visited during these years. He lived in that part of Randolph known as "Jones' City," on the Taunton Turnpike. A large, old Colonial house still standing, No. 85 Canton St. 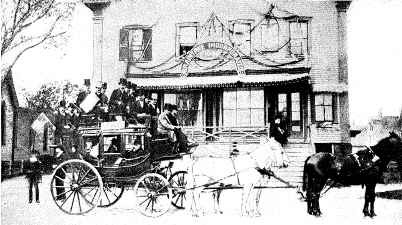 Still another meeting place was at Lemuel Dickerman's, Stoughton, which was on the corner of what is now Freeman Street and Washington Street. Later owned by Major Gay. 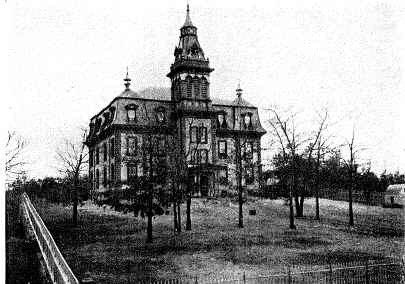 This building became a part of Dr. W. E. C. Swan's block, which was burned in 1892. There is now no record of meetings from Jan. 2, 1809, to Dec. 7, 1818, although the recorded vote passed by the Musical Society in Stoughton in 1813 to lend this Society "all the books they may want, and a bass viol," shows conclusively that the Society held meetings during this period that were not recorded. We also learn from one of Mr. D. T. V. Huntoon's papers that when the news of peace reached Canton on the 13th of Feb., 1815, "the occasion was celebrated by an old-fashioned 'sing' at the house of Samuel Carroll, known as Carroll's Tavern, and the timbers shook with the ancient melody." At the meeting, Dec. 7, 1818, Samuel Talbot resigned the office of President, and the Society chose as its officers: Edward French, President; Thomas Dunbar, Vice President, and Elijah Atherton, Secretary. During the years from 1809 to 1818, Elijah Dunbar, Esq., had died. Edward French, the newly-elected President, was a fine singer and composer. One of his most frequently sung tunes being "New Bethlehem." A meeting was held at Samuel Johnson's, Sharon, June 5, 1825. This old hotel, formerly in P.O. Square, was later moved to High St., opposite the Primary School. At this meeting, it was "Voted that Thomas French, Nathaniel Gould, Esq., and Elijah Atherton Esq,, be a committee to request some suitable person to deliver a sermon at Stoughton before said Society on Christmas Day." It was also "Voted that the committee select suitable music to be sung in public." This was the beginning of the practice of holding its meetings on Christmas Day, which has been preserved, without intermission, ever since, a period of sixty years, and it has become in the minds of the members a sacred duty, to be participated in at the cost of the postponement of everything else. The meeting was held on Christmas, at Capen House, and the President, Thomas Dunbar, and 25 others were present, and it is recorded that there was an agreeable sing, but there was no sermon delivered. Leonard Everett's Hall was on the present site of the Canton Historical Society's building. Old house and store burned Oct. 28, 1831. At the next meeting, held at Leonard Everett's Hall, in Canton, June 5th or 6th, 1826, it was "Voted that the members of this Society furnish themselves with the 'Handel and Haydn Society's Collection,' to be used at the next meeting." We come now to the fulfillment of the vote to have a sermon on "Christmas Day." The records, dated Dec. 25, 1826, at Samuel Johnson's say that the Society assembled at the meeting house, in Sharon, for public worship. Sermon was delivered by Rev. Mr. Goldsboro, minister of the Church in North Bridgewater. Subsequently, they met in the hall for singing and probably used the "Handel and Haydn Society's Collection". There seems to have been a movement made for the introduction of women as singers. No mention is made in the records of their assisting in the singing or having been present until several years later, to wit, Dec. 25, 1827, at Leonard Everett's, when the Rev. Benj. Huntoon, William L. Stearns, Miss Billings, Miss Leonard and Miss Dunbar were present as invited guests. 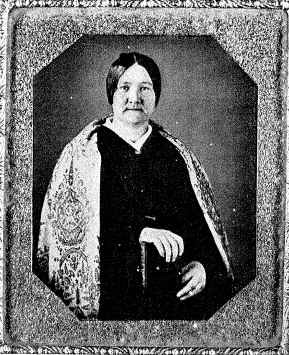 Miss Billings was the daughter of Isaac Billings and is now (1886) living in Boston at the age of 82, the widow of Lyman Kinsley, and was a member of the choir of the 1st Church in Canton as late as 1843. Miss Leonard was the daughter of Samuel Leonard and Miss Dunbar was the daughter of Thomas Dunbar, then the President of the Society. Miss Leonard married Mr. William Horton, now resident in the west, and their son is Rev. Edward A. Horton, now minister of the 2nd Church in Boston. The meeting of June 2nd, 1828, was held at Capt. Charles Ide's house, still standing, No. 1 South Main Street, Sharon. Capt. 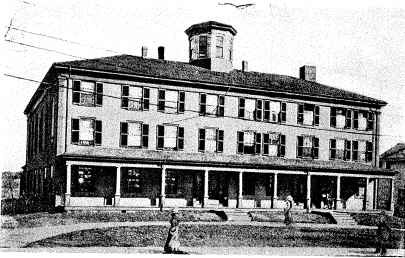 Elisha Swan's Hotel, now standing, is on the corner of Central and Turnpike Streets. This large brick house was built by the South Boston and Taunton Turnpike Corporation in 1807 and styled the "Washington Hotel." 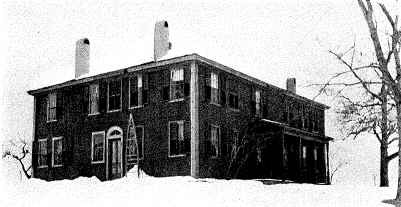 At a meeting held at Swan's Hotel, in Stoughton, Dec. 25, 1828, it was "Voted to choose a committee of four, one in Stoughton, one in Canton, one in Sharon and one in Randolph, to get subscribers for printing the old Worcester Collection, and also voted and chose Thos. Capen, Benj. Richards, Nathaniel French and Henry Thayer, committee." "Voted that the committee see what they can get the Collection printed for and report at the next meeting." At the next meeting, Feb. 18, 1829, at Leonard Everett's, Canton, there is found no report of the committee on record as to the publication of the Worcester Collection, which the Society seems to have abandoned, as we find that at this meeting it was "Voted to publish a collection of Music, consisting of about three hundred pages of such music as the Society shall direct;" also "Voted to choose a committee to select music for the Collection." "Voted to choose four from each town." Voted and chose Samuel Swan, Nathan Atherton, Oliver Hayden and Elijah Atherton, committee for Stoughton. Benj. Richards, Joel Hewins, Elijah Hewins, Jesse Billings, committee for Sharon. Thos. Dunbar, Thos. French, Samuel Leonard, Nathaniel French, committee for Canton. Isaac Niles, Chas. Wild, Sidney French, Walter French, committee from Randolph. By vote, each member was permitted to bring a piece of music before the committee to be sung. James Capen was made chairman of the committee, in place of Samuel Swan, and Nathaniel French and William Dunbar be a committee to get a prospectus published at the expense of the Society. At an adjournment of this meeting, held March 11, 1829, at the Capen House, the following persons were chosen a committee to ascertain what proportion of the music selected by the Society was in the major and what proportion in the minor keys, and whether suitable number of different metres were selected, and to suggest such alterations as they might judge expedient, and report at the adjournment. The committee were Thos. French, Jonathan Linfield, Deacon Joel Hewins, Henry Thayer, Samuel Crane, Thos. Dunbar, Samuel Swan, Jedediah Morse and Chas. Wild. The Society had now published a book and on Nov. 10, 1829, at Samuel Johnson's, Sharon, Thos. French, Nathan Atherton, Friend Crane and Benj. Richards were chosen a committee to see on what terms Marsh & Capen would print seventy-two additional pages of music and bind the same with the volume recently published by them as the Stoughton Collection, such Collection being highly disapproved of in consequence of the publisher having omitted many pieces selected by the Society, and substituted others in their room without the knowledge or consent of said Society. "Voted to adjourn to Sunday, Nov. 22, then to meet at Deacon Abraham Capen's Hall, in Stoughton. At the meeting held Nov. 22, 1829, the committee on book reported, and after discussion of the report, Nathaniel French was chosen a committee or agent to make the offer to Marsh & Capen for the new edition of the book and, if accepted, to furnish the music for the addition and superintend the printing, etc." A story has been handed down that Mrs. Ezekiel Dickerman from Stoughton was the first woman soloist to take part in the "sings," in the year 1829. We are told she had a beautiful soprano voice. 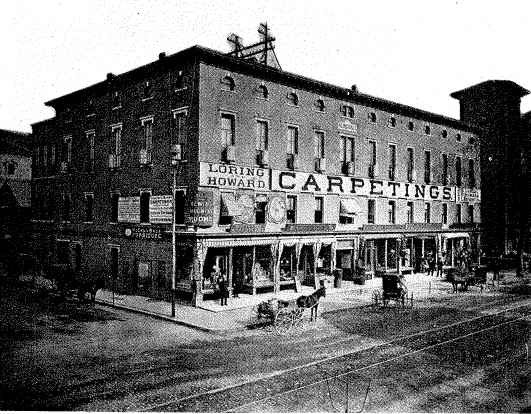 There were ten meetings at various places, including Jacob's Hall, Randolph, which was in "Jacob's Tavern," in 1829, and later known as the "Norfolk Hotel," in 1845, and still later as the "Howard House." On Dec. 25, 1834, they met at Robert Porter's, at Stoughton. 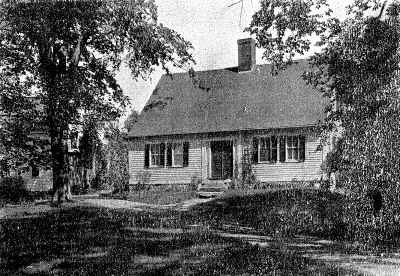 This house was built where the Town House now stands and was moved to 27 Porter Street, its present site. "Well can I remember when the Society used to meet at father's and no doubt he helped to keep alive the spark that has kindled the interest in it for many years. The meetings were held only in the winter, and always at the full of the moon, as the streets were unlighted in those days, and there was less liability for storms. Those who lived at a distance came in their old high-back sleighs. Father would say, 'I guess so and so can't get here tonight, the roads aren't cut through.' Soon we would hear in the stillness the tinkle, tinkle of bells. I particularly remember a Mr. Morse, of Canton, who was pretty chilled, but after being warmed with hot drinks he was all right. Our dining room table was placed in the sitting room, all the leaves put in; a smaller one, square (which I have now) was put alongside, around which the singers were seated. "On the tables were large, dishes of apples; also pitchers of sweet cider for refreshment during recess. I think the hymn books used were called 'Continental Harmony,' and it was my duty as a little girl to collect and count them and put them away. Many happy memories come to me as I write." Another favorite meeting place was James Bent's, at Canton, in more recent years called the Massapoag House. Burned some time ago. The site was opposite the Canton High School on Washington Street. The Society in 1835 chose a committee to engage some one to deliver an address, which looks like a celebration of their 50th anniversary, but no record is given of any meeting, 1836. 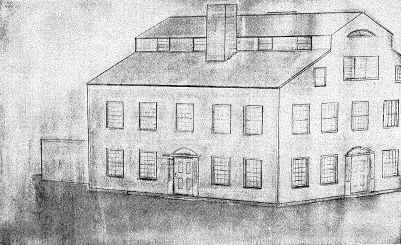 The first record after Dec. 25, 1835, being Jan. 2, 1837, at Elijah Scott's Hall, or "Capen House," when the committee on an address reported they had engaged Dr. Ebenezer Alden, of Randolph, to deliver an address before the Society that day. The address was delivered at the meeting-house of Mr. Ballou's, in Stoughton. I have not been able to ascertain that this address was printed. We have now glanced at the history of the first fifty years of the Society. June 4, 1838, at the "Capen House," the Society voted to dispense with the practice of using spirits at their singing meetings. Now the Society takes an important step. Hitherto it had been their custom at their meetings to sit at tables in the evening, lighted by candles, and sing, their decanters and glasses being passed around for each to use. Joel Talbot, President. Elijah Atherton, Vice President. Charles Alden, Secretary. Henry Thayer, 1st Chorister. James M. French, 2nd Chorister. And a new feature was a vote to publish the proceedings and motions of the next meeting in the Dedham papers. Then there were no papers published in Stoughton, Randolph or Braintree, but a paper was published in Canton, called the "Dedham Patriot and Canton Gazette," the publishers of which were desirous of increasing their circulation. Politics ran high in the country and the "Patriot" was a Whig paper, and there was a paper published at Dedham called the "Norfolk Democrat,'' and it was voted to publish in both, showing that the Society had members of both parties, who were influential. The Presidential campaign which followed was remarkable for its song singing at its public political meetings. The two meetings next held were at Samuel Churchill's Hall or Capen House, Stoughton, June 1 and Dec. 25, 1840, and it was then voted to dispense with the advertising of the meetings, and it was then voted to meet at Union Hall, in Canton, Fast Day, 1841, which meeting was adjourned to Christmas Day, Howard House, 1841, and then to June, 1842, at Churchill's Hall or Capen House, and it was then voted to meet at Hayden's Hall, or Capen House, in Stoughton, Dec. 26, 1842, where the old officers were re-elected, choice of officers in 1843. 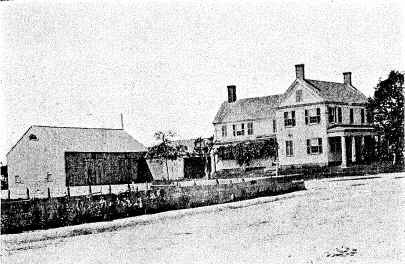 In 1840, Zadock Leonard had a tavern at the junction of Church and Neponset Streets. The hall was known as "Union Hall." the building is still standing, owned by his son, Mr. Winthrop Leonard. At Stoughton, in Hayden's Hall, 1844, Dec. 25, it was voted that the ladies be invited to sing with the Society, their suppers to be paid for by the Society, and also that a committee of one from each town be chosen to invite Trebles to sing with the Society, and Mr. Glover, of Stoughton; Morse, of Sharon; Morse, of Canton; King, of Randolph, and French, of Braintree, be the committee. Eleven candidates were nominated for membership and it was voted to sing from the "Academy's Collection of Choruses," and from "Billings & Holden's Singing Book." Joel Talbot, President. 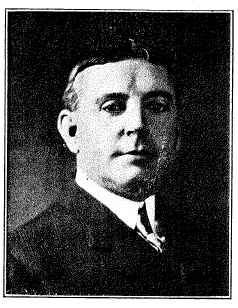 A. W. Whitcomb, Secretary. Thomas Capen, Vice President. J. M. French, Chorister. Soloman L. White, 2nd Chorister. And it was also voted to choose a committee of three to invite instrumental players, who may be present, not belonging to the Society, as they think proper. Chose Morse, of Canton; Sumner, of Stoughton, and A. W. Whitcomb, of Randolph. At a meeting held at Stoughton, Dec. 25, 1846, a special committee of three were chosen to invite ladies to sing with the Society. The committee were James M. French, S. L. White and Isaac Glover. It was also voted to adjourn one year to meet at Braintree and that J. M. French be a committee to provide a place of meeting. Fifteen gentlemen were proposed as follows: Winslow Battles, of Dorchester; Edward Hobart, W. C. Penniman, David N. Hollis of Braintree, Samuel M. Holmes, Isaac T. Packard of North Bridgewater, H. S. Packard of Stoughton, Coridon Spaulding, Enos Upham of Canton, John Berry Thayer, Hiram C. Alden, William A. Bigelow, Jonathan Jones of Randolph, Peter Gilman, and Aaron H. Gage of Braintree. Dec. 25, 1848, meeting held at Randolph, but few members present on account of storm and choice of officers was postponed till the next meeting, and chose A. W. Whitcomb, S. L. White, Joel Talbot, Charles Hayden and Isaac N. Glover to report as to a meeting of the Society to be appointed to accommodate the old members. This committee reported that the Society hold a meeting at Stoughton, Jan. 11, 1849, at one O'clock. This report was accepted. Ladies were invited by a committee to sing with the Society, and nothing is said as to the presence of the old members. One young man was invited to become a member from Canton; also R. W. Jones, Henry Clark and J. W. Belcher, of Randolph. Charles D. Hayden, Vice President. Soloman L. White, Vice Chorister. Fifteen gentlemen, who had been proposed, including Hiram Wilde and the young man from Canton (Samuel B. Noyes) were admitted as members. Thomas Capen, President. Charles D. Hayden, Vice President. A. W. Whitcomb, Secretary. Peter S. Gilman, 1st Chorister. Hiram Wilde, 2nd Chorister. The Society also passed a vote of thanks to James M. French and Soloman L. White for their services as choristers, and it was also voted to rescind the vote to charge 12 l-2c attendance for spectators. Dr. Ebenezer Alden, having presented to the Society 30 copies of the "Ancient Harmony," received the following motion, presented by John King, Esq., of Randolph, which was passed, "Whereas, Dr. Ebenezer Alden has this day presented to the Society a set of singing books to be kept for the use of the Society. Resolved, that the Society accept with pleasure the valuable gift and tender their sincere thanks to the donor, and that this resolution be placed upon the records of the , Society." It was voted that the Secretary have charge of the books and have them properly marked and numbered; also sing from them at the annual sing, Dec. 25, 1852, at Stetson Hall. 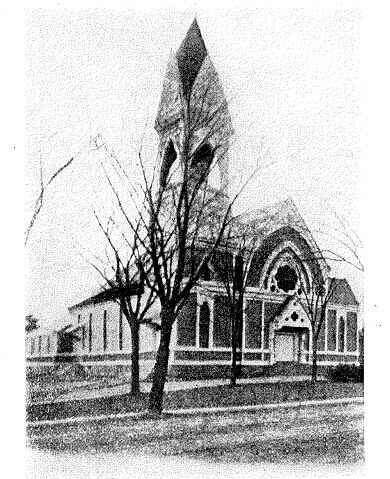 This hall is still in existence at the corner of North Main and Union Streets. The Society at its meeting at Stetson Hall, Randolph, Dec. 25, 1852, passed resolutions of condolence on the death of Peter Gilman, a chorister, who had died since the last meeting, the committee to prepare them being Dr. Ebenezer Alden, Charles D. Hayden and Alfred W. Whitcomb. 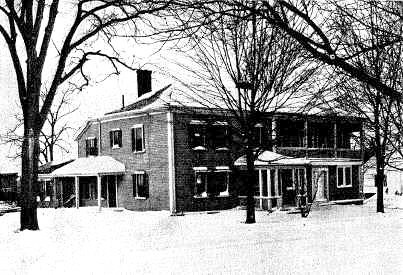 On Dec. 25, 1856, a meeting was held at Monatiquot Hall, in South Braintree. This building has been remodeled and is now known as Whitman's Block, corner of Washington and Summer Streets, occupied by the Odd Fellows. 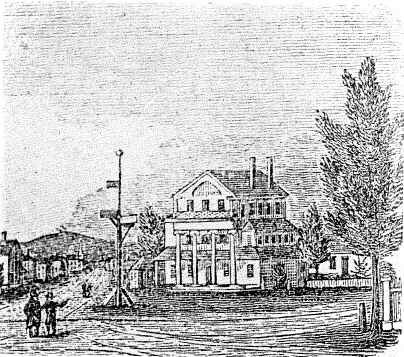 Dec. 25, 1859, the Society met at the Town Hall, in Braintree. 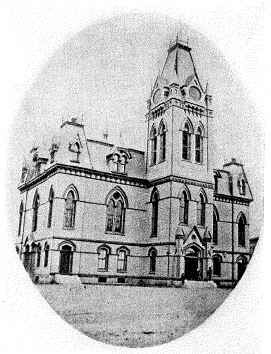 This building was the second Town Hall, built in 1858, and destroyed by fire in 1911. The new Town Hall occupies the same site, Washington Street. At this meeting, a collation was provided by the ladies of the town. Hiram S. Packard, then the Secretary of the Society, concludes the record with this remark: "This was one of the best meetings the Society has enjoyed for a long time. The citizens of Braintree entertained the company in a manner which was highly commendable. One new feature of the entertainment was a free collation, which was prepared in a style that reflects great credit on the ladies of Braintree." 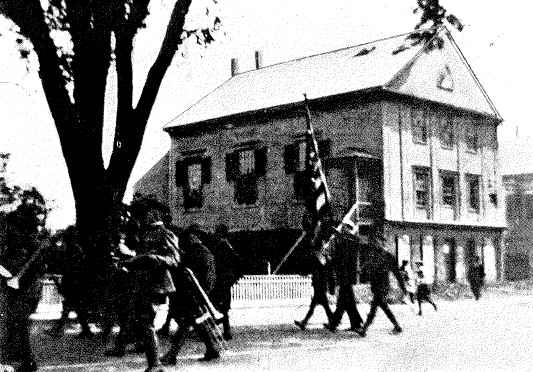 At Braintree Town Hall, at the Christmas meeting, 1864, after appropriate remarks by the President, Perez W. Cushing (grandson of William and Lucy (Swan) Billings) relative to the condition of our country and words of eulogy of those who have fallen in its defense, .it was voted unanimously, "Resolved, as a tribute of respect to the memory of Capt. Horace Niles, Capt. J. Wilson Ingalls, Sergt. W. Frank Gill of Randolph, and Addison H. Johnson of Sharon, formerly members of this Society, all of whom have bravely fallen in the service of our Country, that, as our expression of our heartfelt sympathy with their relatives in their deep affliction, this resolution be entered upon the records of this Society." "Resolved, that a copy of the foregoing resolution be transmitted by our Secretary to the families of the deceased." Feb. 21, 1871, Resolutions were passed on the death of Joseph Porter, of Braintree, President of the Society. After the death of Mr. Porter, Robert S. Sumner, of Stoughton, was acting President until Dec. 25, 1873, when Mr. Winslow Battles, of Randolph, was chosen President. It was also voted that the ladies present in the choir be cordially invited to become members of this Society. During the next few years, the Society membership was increased wonderfully, many ladies joining in 1874, and a lively interest in rehearsals and concerts existed. Oct. 24, 1874, there was a meeting at the Holbrook Town Hall. This building was destroyed by fire Dec. 25, 1877. A new municipal building now occupies the old site. 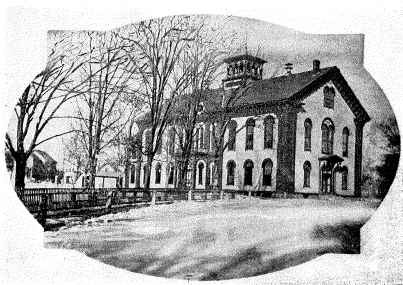 On Jan. 22, 1875, there was a meeting at the High School Hall, in North Easton. This building was moved from the original site and made for use of lower grades, and a new High School was built on the same spot. In South Weymouth and Weymouth, meetings were held in 1875, showing a wider interest among the members. Press notices in the "North Bridgewater Gazette" in 1872-1876 tell of the concerts given in "Music Hall"; that the chorus was so large that the stage had to be extended for the seating of over two hundred singers. About this time, the members of this Society, feeling that a peculiar and imperative duty rested upon them to make an effort to rescue from oblivion the works of the early American composers of sacred songs and to select such pieces as they considered worthy of preserving, and transmitting to posterity, and cause them to be made into a book for the use of the Society at the "Christmas gatherings." 1st That the Society publish a book to contain almost exclusively the compositions of the early composers of the country. 2nd That the first edition consist of four hundred copies, the book to be of the shape as to length and width of the "Ancient Harmony Revised," and to be about 200 pages of musical matter, to be called the "Antiquarian." 3rd That the members individually own their books, which shall be furnished at not over 75 cents per copy. The 4th suggestion was as to the disposal of the edition to subscribers. As a result of the meetings and deliberations of the committee, a, book was published, called "The Stoughton Musical Society's Centennial Collection of Sacred Music," consisting of selections from the Earliest American Authors. As originally written, together with a few selections from European and modern composers. Published by Ditson & Company. Mr. James Madison French, late of South Braintree, was a superior tenor singer and did much musical work besides being a chorister of the old Stoughton Musical Society. For the last 15 years of his life he was blind, and this Society gave a concert in the Town Hall of Braintree for his benefit. At this concert Mr. French stood on the stage, sightless, and sang a solo. As an encore he gave, "And Now Kind Friends I Bid You Adieu", leaving the audience in tears. Mr. Marcus A. Perkins, of Braintree, was a beautiful tenor singer, a Civil war veteran and one of the Past Vice-Presidents of the Society. On the occasion of the National Encampment at Washington, D.C., which Mr. Perkins attended, he was entertained in a private home. As it happened, the members of this family were southern sympathizers, and very musical. While he was with them one evening, they had a sing, showing what they could do in a musical way. After a while someone asked Mr. Perkins if he ever sang. "Well, sometimes," was the reply. "Oh, please sing for us," came from the entire party. Whereupon, he stood up and sang the "Star Spangled Banner" and rendered it so well that they were simply amazed and forgot their southern leanings.